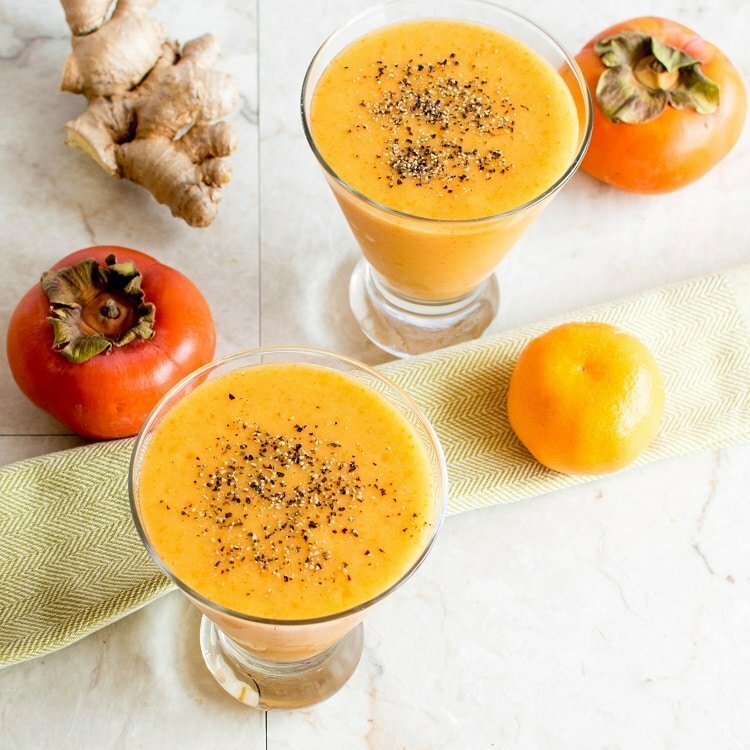 Immune Boosting Persimmon Ginger Smoothie is loaded with Vitamin C, antioxidants, fiber and it’s a great digestive beverage. 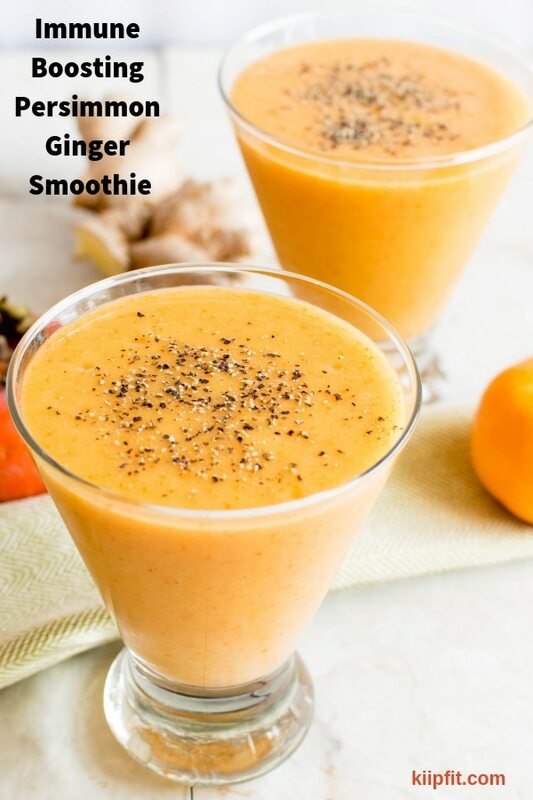 This smoothie suffices all nutritional requirement of the body to fight the flu season. I have been away from blogging for a while and that is because I was expecting my second baby. It was a tough pregnancy and I was bed ridden for a long time. However, finally my little precious baby came out crying and is now 3 ½ months old. Time flies and when I look back my entire pregnancy was an experience. The baby and I had to be saved yet the baby needed time in the womb. My older daughter was going through emotional crisis as well because she was suddenly left on her own. In the midst of all this crisis my mom came as a savior and took control of the entire situation. We sailed throughout 2018 successfully. I achieved my healthy and happy family. Now, we are in 2019 and I am beginning this year on a happy note with my family near me. Since I am trying to get back to being normal and fighting sleepless nights I am slightly thrown out of schedule. However, I came to realize that it’s the flu season and this year it arrived late. Therefore, I came up with this Immune Boosting Persimmon Ginger Smoothie. I love persimmons and every year I try to create a recipe with it. It is rich in antioxidant and high in fiber. Every bite of this juicy fruit is delicious and satisfying. Oranges as we all know is loaded with vitamin C which is the most important requirement to fight the illness. 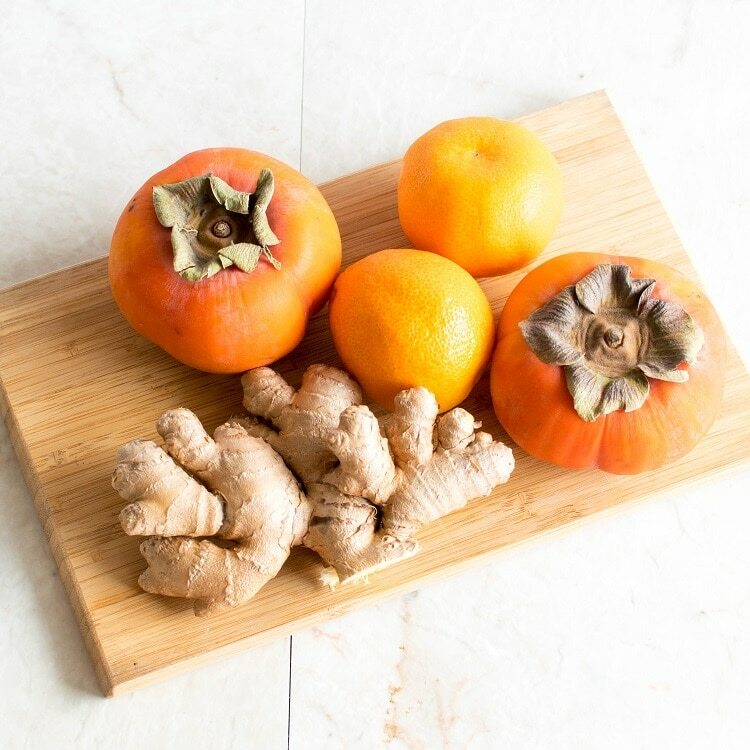 The citrus flavor of this fruit is refreshing and energizing. Ginger is a great digestive. It has anti-inflammatory effect and helps in controlling nausea. Mint leaves helps improve irritated bowl syndrome and facilitates good digestion. Unsweetened Almond Milk is low in calories and does not raise blood sugar. It is rich in Vitamin D and reduces the risk of heart disease. Crushed Black Pepper is mainly used in Ayurveda. It enhances nutrient absorption and reduces inflammation. Black pepper is rich in vitamins and minerals. It also provides the soothing effect to the sore throat. Therefore, Immune Boosting Persimmon Ginger Smoothie has taken over my house right now. At the time I blended this smoothie I could not help but consumed the entire serving. I thought it’s just me. However, I blended this smoothie again for my husband and his reaction was the same as mine. It can be made kid friendly by just not adding crushed black pepper. Kids usually love the sweet and citrus flavor of the beverages and my daughter went gaga over it. I am sure your family will love this smoothie as much as we all do in my home!!!!! 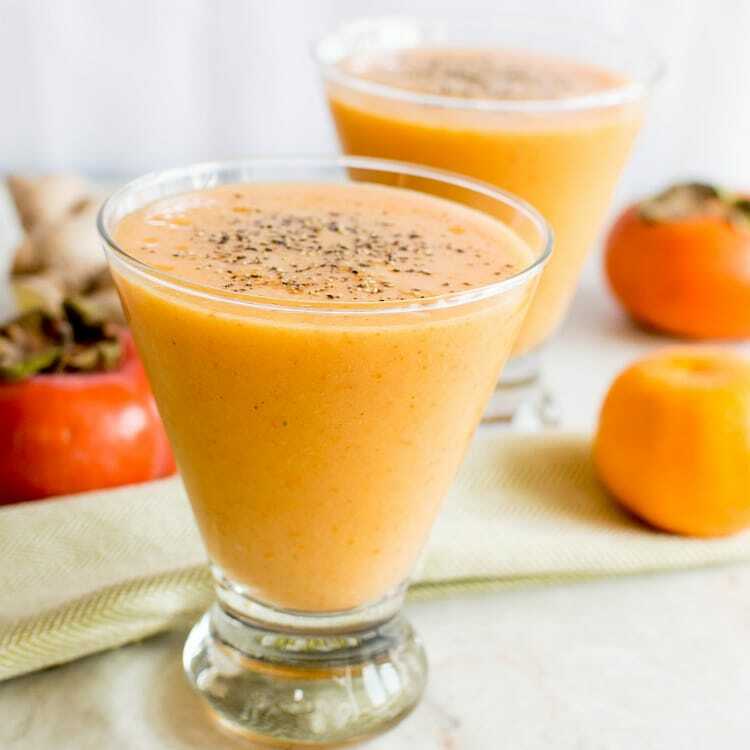 Immune Boosting Persimmon Ginger Smoothie is loaded with Vitamin C, antioxidants, fiber and it’s a great digestive beverage. 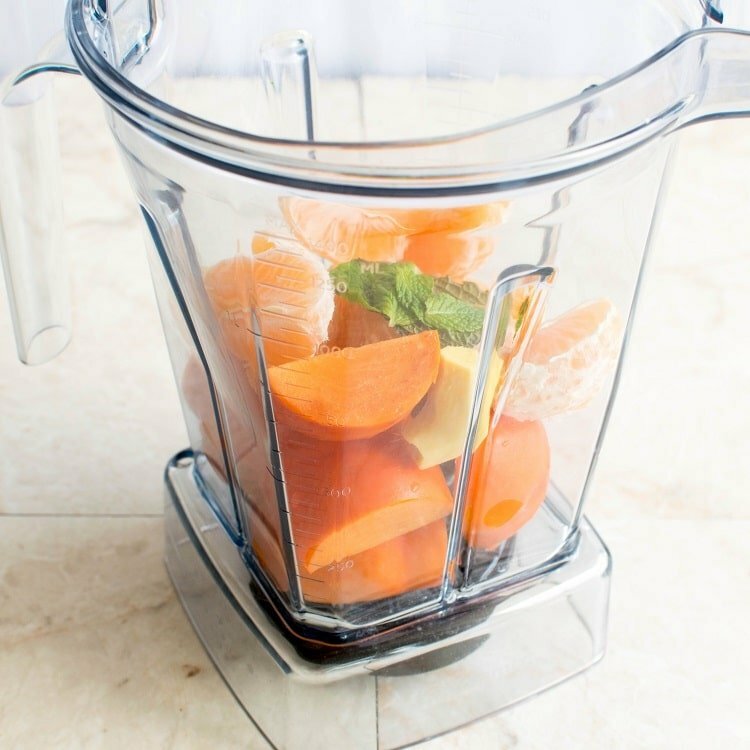 Combine all the ingredients in a blender and blend smooth. Pour the smoothie in the serving glasses and sprinkle some crushed black pepper for a stronger taste. I used a high speed blender and all the ingredients blend extremely smooth. I also like to add fiber to my beverages so I kept it as is. You may strain the smoothie before consuming it for a smoother and thinner consistency. It tastes best when consumed immediately. However, it can be kept in the refrigerator for a day or at room temperature for half a day. So excited about this smoothie recipe! I have been trying to find ways to boost my family’s immune system outside of vitamin supplements. I will be giving this smoothie a try! Delicious, refreshing, and beautifully-presented. 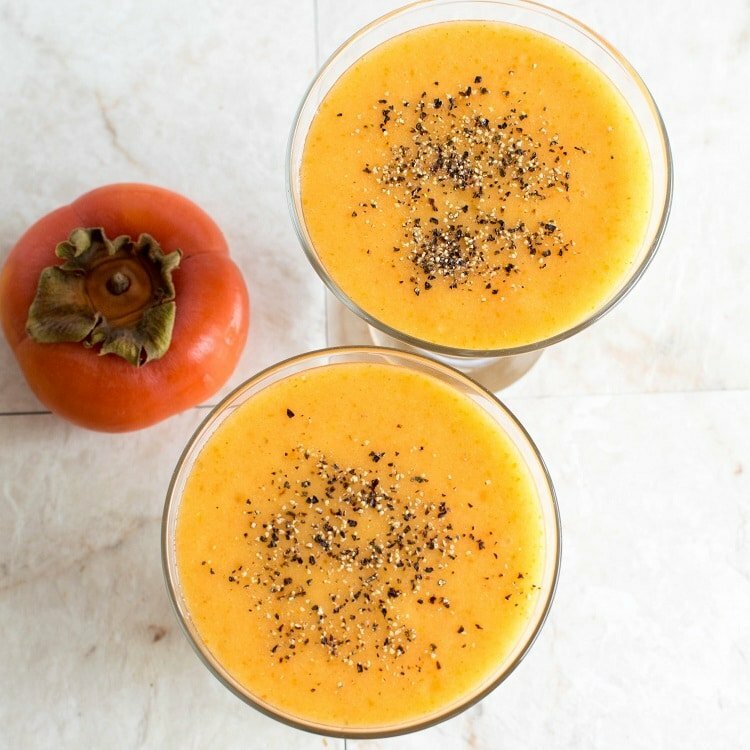 I’ve heard about persimmon only very recently and this is a good way to prepare it.